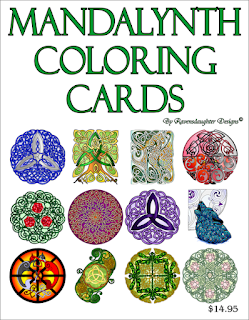 How did you first become interested in Celtic art as a mindfulness tool? Through observation. 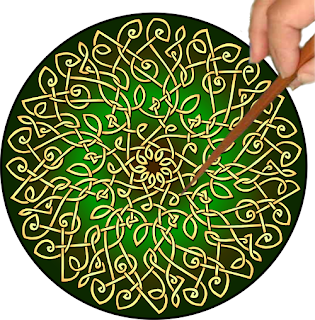 I began showing my Celtic collection as art, but when I first made what I called “meditation plates,” people were doing more than meditating. They were entering altered states. This happened repeatedly until I realized I was effecting a change in the brain. Behavioral wellness professionals helped me understand what I was doing, and now I have some scientific results to support my work. What do the scientific results show so far? In all my years of measuring brainwaves, I have never seen anything change brain patterns that quickly and dramatically. It is possible that with enough practice this new, more relaxed pattern in the brain would become more stable. However, we are generally not looking at this intervention as a complete treatment strategy, but rather as a tool to disrupt an over-activated brain and allow the opportunity for something different to happen. This tool essentially creates space. It can be used when someone is actively engaged in an anxiety/panic attack, is feeling agitated or hypersensitive, or simply as a device to maintain a calm presence. We have placed several of these (Mandalynths) in our waiting area for clients to work with while waiting for their next appointment, with positive results. There are different categories I recommend for different conditions. 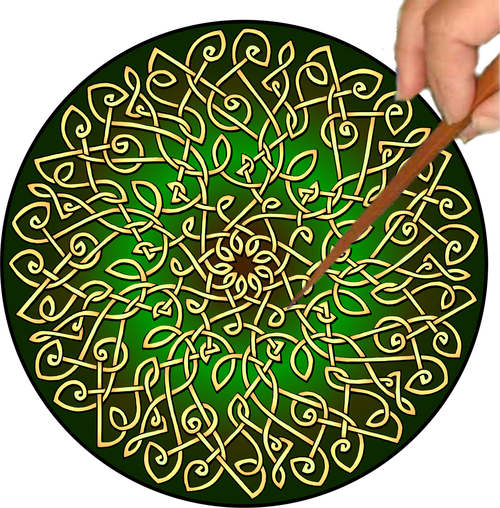 Open Celtic Art Mandalynths are gentle and lulling to trace. They also have a rhythmic count, which means that when you trace them they have a tempo. 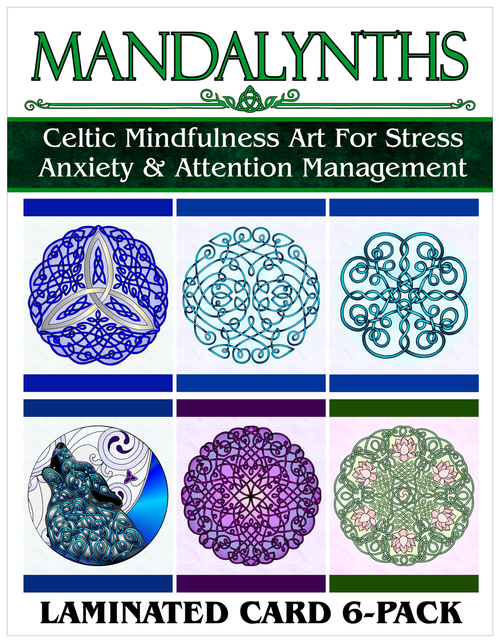 Open Mandalynth designs are best for relaxing an agitated mental state such as stress, anxiety and panic. 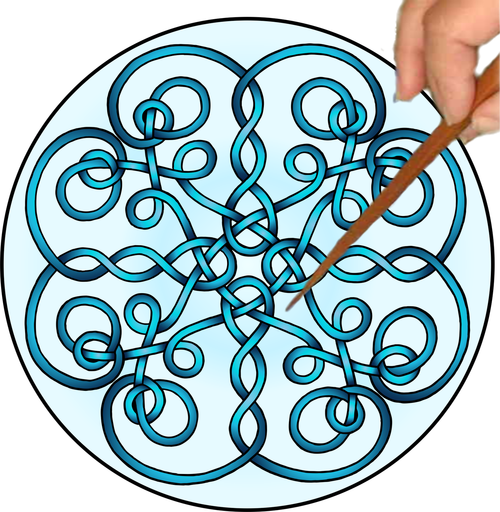 Medium Celtic Art Mandalynths are a little tricky to trace. However, they also have a nice flow to the overall pattern. Still, they make you focus more closely. Medium Mandalynth designs are best for attention issues, such as ADD, ADHD, high-function autism, and the “ruminating” mind which obsesses and fixates so much that it creates anxiety. Tight Celtic Art Mandalynths are difficult to trace. They are not relaxing, but some people love challenge. Tight Mandalynth designs are best for gifted minds, puzzle-solvers, and people who love intensity. Lower-functioning autism has also responded well to these types of designs. 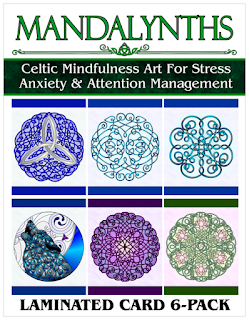 How do you explain the recent surge of interest in art-based mindfulness practices such as Mandalynths and adult coloring books? With the general public now more aware of mindfulness, there is an uptick in activities that help create the mindful experience. While art therapy is an excellent choice, the market has dropped for adult coloring books. It was a bit of a craze, but you see less and less of them at the check-out counter. Of course, coloring will always have a place in classrooms. It’s a good mindful activity and sparks creativity. However, what I discovered was tracing, not coloring. When you color, you must still make decisions; where to place the color, do you stay within the lines, do you change color. When you trace, you make no decisions. You simply observe and follow. 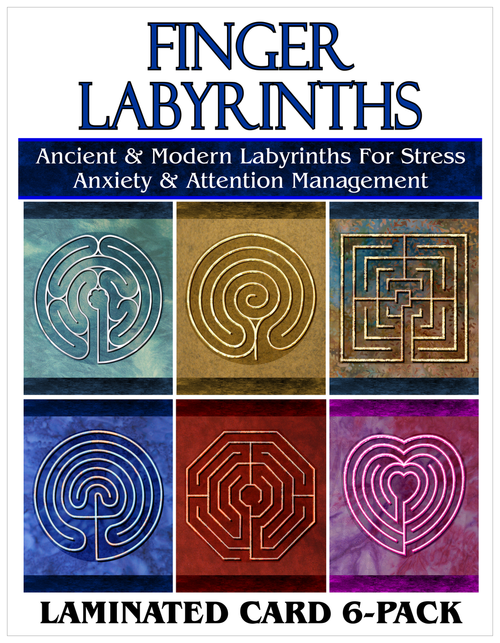 This allows the brain to move into a more meditative state. On my website, CelticArtStore.net, you can find a brain mapping case conducted by Dr. Jeff Tarrant. He measures the brain of an adult female on the Autism spectrum. As you can see in the image below, her baseline shows great activity in the Alpha and Beta waves, but after 3 minutes of tracing a Celtic Mandalynth the activity shifts to the Delta and Theta brain waves. She is simply watching and to some extent “drifting”. Even so, she is still very aware. Tracing produces the state of “relaxed awareness” that you achieve in yoga. It’s a state where you are very receptive to audio stimuli because visual and tactile are occupied (you must watch what you trace). It’s a bit like doodling – which is another very mindful activity – and thus tracing can be used as “controlled doodling” to help focus a student’s attention during class so they can better absorb and retain information. Teaching someone how to take a break from the present, and showing them that it can be easy. So many people think they need to spend hours meditating or going to a yoga class. That just isn’t so. We used to be mindful when writing in cursive script, or building a model ship or sewing and knitting. We don’t do crafts as much. We are an “impulse-driven” society, from cell phones to video games. Teaching someone that mindfulness is easy is an amazing thing, especially when a person tells me they can never calm down. Getting them to focus despite themselves is amazing. I breathe in between daily activities. I count rhythmically in traffic. 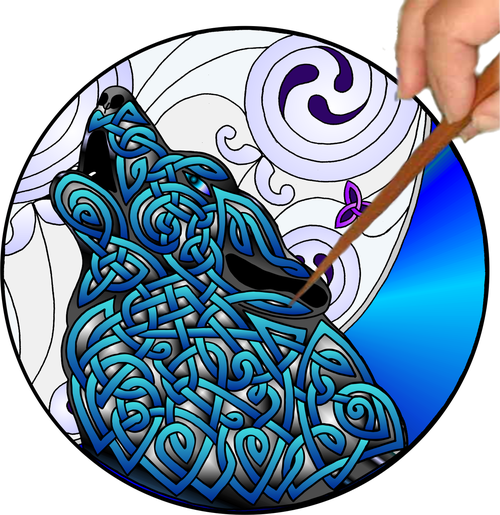 I am truly mindful when I’m drawing more Celtic Art. There just is nothing else like that wonderfully calm state of awareness. It’s so helpful when the brain is busy, busy, busy.